Use this quality Hibanker or Dredge Hopper to convert your stream sluice into a Hibanker or land dredge. (Hopper is pictured with the optional dredge adapter). The (grizzly) classifier screen has recently been redesigned for durability and ease of use. It features 1/2″ spacing between the bars and only every other bar is welded to the box allowing for easier jammed rock removal vs. the old laser cut aluminum style. The grizzly can be removed by unscrewing it from the back of the hopper. The top of the hopper is 18 inches x 18 inches with spray bars. The water inlet is equipped with a 1 1/2 inch slip fitting which can be removed to use 1 1/2 inch pipe fittings. The water supply can be adjusted with a valve which is included. 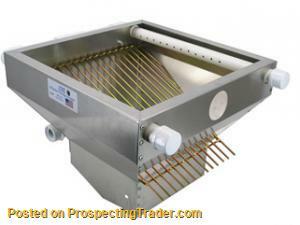 Comes ready to go as a hi-banker hopper or can be rigged to be used as a 1.5″ or 2 inch or 2.5″ dredge hopper. The dredge attachments are just $25 additional. Hopper works on the JOBE 45 Yellow Jacket, the Keene A52 sluice, or most any 10 inch wide sluice. The mounting holes are pre-cut to bolt onto the JOBE sluice and the JOBE sluice stand. Mounting to the Keene A52 requires two 1/4″ holes to be drilled on the sides of the hopper. Total weight is just 14 pounds. The removable classifier screen weighs about 3 1/2 pounds. Highbankers/Dredge combo are the ultimate in flexibility. You can use as a small dredge, highbanker and most convert to a stream sluice. The drawback is that the motor/pump sit on the bank while you work. This limits the depth at which you can dredge. Gold dredges have the motor integrated into the machine itself. So it can float out into the water and is limited only by the length and power of the suction hose.